onveniently close to the mainland, it is no wonder that pretty Skiathos is widely known as the Greek Riviera. Fishing villages strewn with friendly tavernas exude a wonderful easy-going appeal and no end of golden beaches are packed with water sports opportunities. The hub of all entertainment is found around the harbourâ&#x20AC;&#x2122;s restaurants and bars, where the nightlife is always lively. A short sail from Skiathos harbour, tiny Arkos is a Greek paradise; anchor in front of itâ&#x20AC;&#x2122;s fairytale sandy beach on the west coast and visit the excellent taverna for lunch. ith slopes covered in lush woodland, the bountiful island of Skopelos is a visual feast.Anchor in Stafylos or Agnontas Bay, each with individual charm and pretty beaches framed by fragrant pines. Activity seekers can hike the countless meandering trails or explore rocky shores and hidden coves by sea kayak. Visit the whitewashed Chora with sinuous streets and authentic charm, while sunset at popular Panormos Beach should not be missed. warded marine park status, picturesque Alonissos is packed with appeal for yachting. Uninhabited islets nearby exude raw beauty; Gioura has a huge cave, home to a rare species of wild goat, while remote Peristera offers cosy beaches and undisturbed anchorages. Protected Piperi hosts a vast Mediterranean Monk Seal population, whilst Dyo Aderfia is popular with diving groups and Kyra Panagia boasts a sheltered natural harbour at Planitis filled with wild splendour. Soak up the laid-back vibe in seaside villages at Votsi and Roussoum Gialos and climb the hilltop Chora for spectacular views.Take an evening stroll around main town Patitiri and enjoy some delicious local cuisine. n area of environmental importance, the National Marine Park of Alonissos has enthralling appeal. Peristera, laden with lush greenery and exquisite bays, has overnight mooring at the picturesque Steni Vala marina. Uninhabited Pelagos is blessed with deep bays: sail through the narrow northern inlet to discover an idyllic and sandy hidden cove. Nearby Skantzoura and Adelfoi islets offer secretive swimming spots, while wooded Kira Panayia provides a stunning anchorage at Monastery Bay and fascinating ruins ashore. Divers will delight in the underwater city ruins found on the north coast of volcanic Psathoura. ull of character, lesser-known Skyros is a surprising island, strewn with natural harbours and sugary beaches framing the rugged coastline. The hilly chora is decked with sugar-cube white houses, where vibrant tavernas and shops line the narrow streets and exceptional views are found atop the ancient Saint George castle ruins. Creative Skyros locals still practice age-old traditions of pottery-making and woodcarving, providing a great opportunity to acquire authentic handmade goods. 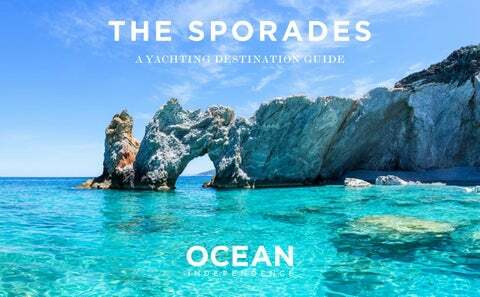 ome only to wild goats, Skyros is surrounded by deserted islets set amongst crystal clear waters - providing a plethora of sensational anchorages and perfect cruising grounds. To the southwest, oblong-shaped Valaxa has protected swimming spots along Liminaki Bay, while the craggy bays of private Skyropoula are surrounded by turquoise sea promising an underwater paradise. Anchor at the southern side of uninhabited Sarakino where a hidden and secluded cove offers sandy swathes exclusively for you. o the south, but not essentially belonging to the Sporades chain, the somewhat undiscovered island of Evia is a hidden gem. Second largest to Crete, visitors can discover an enchanting mix of historical treasures and coastal delights. Ancient monasteries nestle in verdant woodland, while swathes of velvet shore appear around every bay. On Evia’s western tip, stunning Lichadonisia, nicknamed ‘the Seychelles of Greece’ is a cluster of rocky isles, blessed with sandy coves and translucent water - inhabited only by seals, turtles and summer beach bars.To the far south, the miniature archipelago of Petalioi are ten sensational islets, again only accessible by yacht, with emerald anchorages and pristine beaches. YACHT SELECTION A selection of yachts available in the EASTERN MEDITERRANEAN Please note that some yachts might only be able to embark and disembark guests outside Greek waters. Please ask your broker for more details.